This online casino has a truly impressive collection of games. This is probably because it uses Viper, the latest Microgaming software platform available. They have over 500 games in store for their players, all of them accessible and well-run. They have all the classic games that you would look for in any casino, like slots, blackjack, poker, baccarat, craps, and even obscure ones such as Sic Bo and Pai Gow. Really, Royal Vegas has everything an avid casino fan needs. Their slots collection is particularly worth of note, what with their stellar collection of titles. They even have progressive slot machines, so you can be certain of gigantic jackpots and lucrative payouts. The sound effects and the graphics are nothing short of excellent too, just what you can expect from a casino that uses Microgaming. The bonuses given by Royal Vegas Casino are average at most. 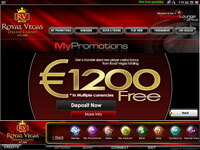 Royal Vegas offer is divided into 3 parts consisting of multiple deposit bonuses the total bonus amount to €1,200. You can claim the bonuses at anytime. Their comps are awesome, though, and if you bother to stick around, you’re sure to get enough loyalty points. These loyalty points can give you access to some of the coolest comps in this side of the internet. They’re also part of the Fortune Lounge Group, so all the points you accumulate from the sister casinos can be used here. As for the banking options, Royal Vegas Casino has everything you’ll ever need. The deposit and withdrawal process is very speedy and very smooth. Their customer service is particularly impressive. It’s online 24/7 and the staff are friendly, well-trained, and helpful. The one gripe I have with Royal Vegas Casino, though, is that despite its name, it doesn’t really accept US players. But all in all, Royal Vegas Casino deserves an impressive 5 stars.